Are you ready for a montage catch up? Oh, yeah, baby! Yesterday was a marathon! I am a Pfaff Lover, and have 2 older machines I switch between. Sticking to one brand provides better accuracy, and they have always been dependable for me. But breakdowns do happen, and they are scary when we depend on our machines daily. This is a front loading bobbin, and the last time I opened it to load a fresh bobbin it would not click in. With closer examination, the bobbin case itself was spinning. I had not encountered this before on any machine, but was not keen on shelling out $80 to fix it. Could I fix something this complicated? Hello, YouTube! Yes, believe it or not, I found enough information online through videos about similar problems to at least understand the problem. Look up bobbin hook shuttle repair. There are 2 parts to the bobbin case, and they needed to be synced back together. Investing about 15 minutes, turning and fiddling back and forth it was fixed, and I had my trusty machine back in play. I went back to sewing, and sew I did! Borders on. Batting found. In line to quilt. Large, loose quilting with Warm&Plush batting. Borders on. Pressed. Ready for quilting. Backing washed. All this in one day was a lot, but I can see light at the end of the quilt tunnel. There are 5 customer quilts left on the rack, and about 6 of my own. That will put me in the black for cleaning up my personal UFO/WIP or PUP pile--Previously Unloved Projects. I see this as moving toward a more responsible work ethic, and though I would never judge anyone else, I need to have accountability. It has taken nearly 12 months. 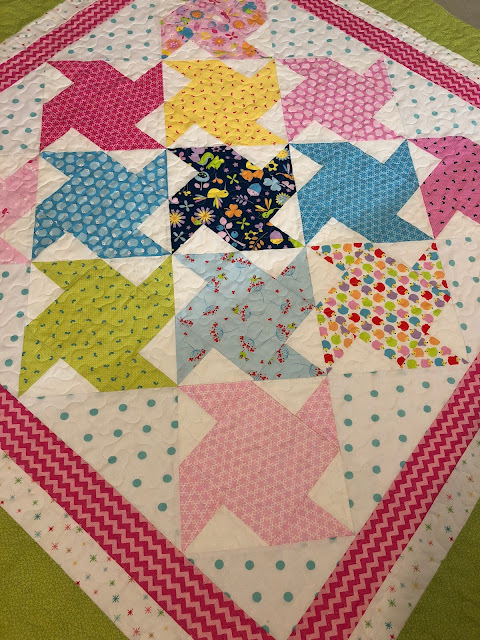 It has been a bit of a boring year pulling one old project after the next into the light, and dealing with it-- I am SO ready for something new, but meanwhile I also need to give a call out to some of the customer quilts I finished from October to the present. They count, too. Enough time spent in my chair. The sun is up, and the studio empty. WTG on fixing your machine yourself - very impressive! And I admire your diligence to make sure your UFOs are flying off the shelves, lol! Just think of the possibilities when you can start something new! Wow, what a whirlwind. Congratulations on fixing your machine. I am used to it with the old vintage Singers I use, however, they don't need much fixing. I do not have a lot done and spent 4 days at the Houston quilt show. Talk about being overwhelmed. I came hone to face my mess and literally don't know where to start. YouTube has helped my husband and myself countless times! He just installed a gps/backup camera/radio unit in his 2003 pickup truck and we had to go to youtube to find out how to get part of the dash board off and figure out how to remove one of the wired units clipped to the dashboard. Youtube to the rescue! And your quilts... GORGEOUS! My goodness, you were busy. No wonder your machine tried to take a break; it probably sensed what you had in mind. Those quilts are terrific, especially the bright log cabin and star combo. Well done! And congrats on your new career as machine repairman. Boy, you really got things done! I love that deep pink Cabin Under the Stars! Those colors are just dazzling. Love that pattern! Good job on fixing your machine; not sure I'd be brave enough to tackle that. Well, maybe on my older machine! Here's to those fun, productive quilting days! What a feat fixing your own machine! Knock on wood - mine are holding up. All the quilts are lovely. You've been busy. I seem to keep starting new quilts instead of finishing old ones. You were very productive! Congrats on all the progress. Wow that was a marathon indeed! Kinda embarrassing in comparison since I have gotten through quilting one section of one quilt. How wonderful that you were able to fix your machine yourself. I will definitely be looking that up, because I do have a machine that I can't use because of the bobbin problem. That's quite the marathon! I love all of your star quilts - each one is so unique. Though finishing up those UFO's may be boring, at least they're getting done. It really is quite tedious to attack the older, less loved quilt projects. Good job squaring so many of them away! I have a lot of finished quilt tops, but those feel different to me. It wears on me much more when there are open-ended projects that have needed attention for a very long time. Your're probably turning the corner on walking into your studio feeling more light hearted and less 'determined' to stick to the plan. :) Love seeing all the good progress! So many beautiful photos! I have to know...what is the backing fabric for the En Provence??? I love it! You have been busy. Well done. Great job on fixing your machine. These are all so pretty, but Cabin Under the Stars is my favorite. Happy Thanksgiving!